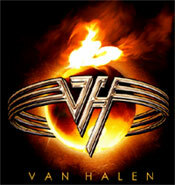 Exclusive: Van Halen Reuniting With Roth For Tour – it finally happened. Eddie and Diamond Dave have buried the hatchet and are going to tour. Van Halen back again in "almost" an original lineup…Eddie replaced the solid bass player/vocalist Michael with his son, Wolfgang (15 years old) in the band. Dude, Dave is a lunatic..but a superstar when it comes to Van Halen rock and roll. My wife Vicky is going to go crazy with this news…I might have to get her a ticket in the front row…if you know what I mean! Bring it on!